Canada is releasing Employment Change, Unemployment Rate and Participation Rate and the US will publish Non-Farm Payrolls and Unemployment Rate. The pair is finding support at 1.27450 with resistance at 1.28100 which both lines are below the weekly pivot point at 1.28810. The EMA of 10 is moving with bearish bias in the descendant channel and it is located below the EMA of 200 and the EMA of 100. The RSI is rising towards the 50 level, the MACD line is on the signal line in the neutral territory and the Stochastic is showing upward momentum. The ADX is not showing any clear signals. The price is below the Ichimoku Cloud and above the Chinkou Span. The Tenkan-sen is showing a downward trend while the Kijun-sen is showing a horizontal trend. 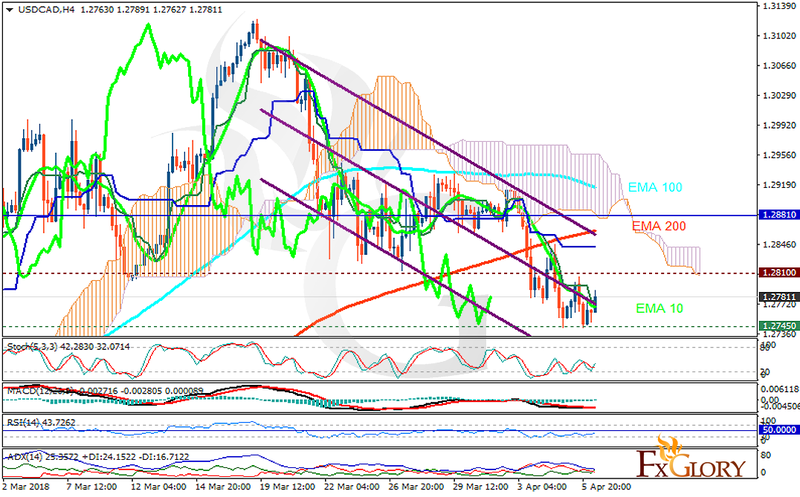 The support area seems to be too strong to be broken therefore long positions are recommended towards 1.29.